24-year old singer/songwriter Scotty McCreery has a lot to say on his new 11-track album, produced by Frank Rogers (McCreery’s See You Tonight, Brad Paisley, Darius Rucker), Derek Wells (guitarist for Kenny Chesney, Brett Eldridge, Little Big Town), and Aaron Eshuis (producer for Ryan Hurd, songwriter for A Thousand Horses, Joe Nichols, Cole Swindell). 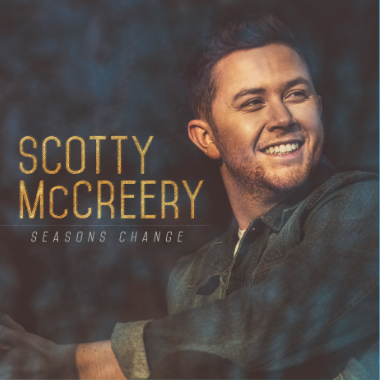 With every song co-written by McCreery himself, ‘Seasons Change’ marks the first time he’s played a hand in writing his entire album. With songs influenced by true-life events that occurred since he released his last album at 19 – including moving out on his own, going to college, getting robbed at gunpoint, losing his grandfather, changing record labels, releasing a book and proposing to his high school sweetheart – ‘Seasons Change’ is a true reflection of where the North Carolina native is in life. The album’s first single, “Five More Minutes,” is closing in quickly on the Top Ten and has already built an impressive history. McCreery performed the song on the Grand Ole Opry stage in 2016, where it quickly became a fan-favourite YouTube video reaching millions of viewers and earning the Rare Country Grand Ole Opry Moment of the Year Award. Although McCreery was not signed to a record label at the time, national radio personality Bobby Bones heard the song and immediately felt compelled to debut it on iHeart Radio’s “The Bobby Bones Show” in 2017. Due to popular demand, it was made available for sale and to radio soon afterwards, ranking at No. 2 on the iTunes US Country Singles Chart on the day of release. “Five More Minutes” became the first song in history to chart in the US Country Chart without being released by a record label. It also earned McCreery the Taste of Country 2017 Indie Artist of the Year Award. Soon after, McCreery signed with Triple Tigers Records/Sony Music Entertainment. To date, the song has earned more than 50 million streams and sold more than 175,000 downloads. The music video, directed by Jeff Ray and featuring never-before-seen home video footage from McCreery’s life, debuted at People and has earned nearly 18 million views on YouTube while also topping the GAC’s “Top 20 Countdown” for six weeks. McCreery made history in 2011 as both the first country artist and the youngest male artist of any genre to debut his first studio album, the Platinum-certified Clear as Day, at No. 1 on the all-genre Billboard Top 200 Albums chart. All three of his albums have debuted at No. 1 on a Billboard Albums chart, with current combined sales nearing 3 million copies. He’s earned one Gold single and three Platinum singles and achieved two Top Ten hits with “Feelin’ It” and “See You Tonight.” The latter song earned McCreery both his first BMI Award for writing one of the Top 50 Country Songs of 2015 and his first Music Row No. 1 Challenge Coin. He won the 10th season of “American Idol” in 2011; was named the ACM New Artist of the Year in 2011; won the CMT Music Award for Breakthrough Video of the Year (“The Trouble with Girls”) in 2012; and American Country Awards for new Artist of the Year in 2011 and Breakthrough Artist of the Year in 2013. In 2016, McCreery released his first book, Go Big or Go Home: The Journey Toward the Dream, and won the Rare Country Grand Ole Opry Moment of the Year Award for his live performance of “Five More Minutes” which became an internet favourite viewed by millions on YouTube.